The growth of near-field communications technology is certainly one key to realizing the promise of the mobile commerce market. Each of the past few years has been heralded as the “year for mobile payments”—and in each of those years, mobile commerce has fallen well short of expectations. But over the last 12 months, there have been abundant signs that the phenomenon is finally starting to emerge as a serious market force. Major players such as Google, Visa and many leading wireless carriers are placing significant bets on the rapid growth of one of the key enablers of mobile commerce: near-field communications, or NFC—a communications technology that, with a touch, connects electronic devices to a reader, which then typically initiates a payment transaction. Similarly, key technology suppliers—developers and producers of semiconductors and card readers, among others—have been making investments to provide the NFC market with the necessary technical foundations. And a powerful forum, 150 companies strong, is moving fast to establish NFC industry standards. More than 200 NFC trials have been launched across 54 countries since 2008. Today, in several of those countries, a shopper can use his phone to simply and quickly complete a transaction at checkout. Indeed, a shopper’s experience with mobile commerce can now begin before she walks into the store; she can receive coupons, view ads and transfer loyalty points, all on her phone. However, like any nascent industry, mobile commerce will require enthusiastic consumer adoption before it can truly take off. In this case, that will mean ensuring the wide availability of devices for consumers and confidence in the security of transactions. It will demand accepted technology standards and business models that are financially viable and equitable for all participants. Mobile commerce will also have to be accepted broadly across many types of merchants that collectively sell a wide range of products and services. And, as if all that didn’t make the bar high enough, various participants will have to address the high infrastructure and other startup costs and rally around standard mobile commerce solutions. Contactless data exchange has been around for years—in the form of cards that allow access to locked buildings, for example, or dedicated payment cards such as ExxonMobil’s Speedpass. Payment by mobile phone is not new either: More than 15 million Japanese consumers, for instance, can use their phones as credit cards. So what’s different about NFC technology? And why does it matter? Essentially, NFC is crucial to the sustained uptake of commercial activity on mobile devices. It’s a standards-based communications technology that simplifies transactions, streamlines the exchange of digital content and connects electronic devices with a touch. Users hold NFC-enabled devices close together—touching or just a few centimeters apart—to access services, interact with content, set up connections, make a payment or present a ticket for admission to an event. NFC moves contactless card technology forward by several steps; indeed, it’s what Accenture believes will enable mobile commerce to become mainstream. For one thing, NFC-enabled devices are highly versatile. They can be used to, among other things, read NFC tags on a museum or retail display, pair Bluetooth devices and share a contact, photo, song, application or video. Used as a virtual wallet, an NFC handheld can facilitate many other forms of payment besides credit. In other words, a consumer’s payment options aren’t limited to his or her “plastic”—the physical credit or debit card. NFC enables the consumer to pay, cash in coupons or redeem loyalty points all in one touch. NFC expands opportunities for traditional payment providers and unlocks new markets for such nontraditional players as Google, Apple and mobile network operators. NFC mobile commerce blurs the lines that divide the payments, mobility and retail industries, presenting opportunities for non-payment players to break into the payments business. Partnerships to move NFC into the mainstream are already forming across industries. The Google Wallet initiative, for instance, includes Citigroup, MasterCard, Sprint, First Data Corp., NXP Semiconductors, VeriFone Systems, Ingenico, ViVOtech and Samsung. The initiative involves “tap and pay” and swiping actions that allow consumers to pay and redeem Google offers (deals on products and services at local or online businesses—for instance, a 10 percent-off coupon at Jamba Juice in New York City) all in one swipe or tap. Consumers can also opt in to receive offers through different applications. In September 2011, following a nearly four-month trial in New York and San Francisco, Google took its Wallet application nationwide. Although its use is restricted to those carrying MasterCards and using Sprint and First Data, the application is accepted by thousands of small businesses along with major national merchants, including Macy’s, CVS/pharmacy, Toys “R” Us, Foot Locker and OfficeMax. Quick Tap, another NFC venture, was launched in the United Kingdom in May 2011, led by Orange, Barclaycard, MasterCard, Gemalto and Samsung. The Quick Tap customer, after transferring money from a Barclaycard credit card, a Barclaycard debit card or an Orange credit card to a mobile payment account, can then tap and pay with a mobile phone via MasterCard’s contactless payments system. At least 50,000 merchant outlets are participating in the program. In response to these moves, several existing payment players, looking to maintain their current industry positions, are rapidly pursuing their own ventures. Visa is moving ahead with its digital wallet, V.me, which involves 14 financial services players. The company has at least 23 mobile payment programs in play in 19 countries, focusing on Android, BlackBerry and iPhone platforms. And in March 2011, Bank of America Corp. launched the trial of a contactless microSD card that allows shoppers in Atlanta, New York and San Francisco to pay with BlackBerry smartphones using both MasterCard’s PayPass and Visa’s payWave applications, which are already accepted by a number of merchants. The message: Now that NFC mobile commerce is becoming a hive of activity, it’s time for interested companies to start drafting their mobile commerce growth strategies. 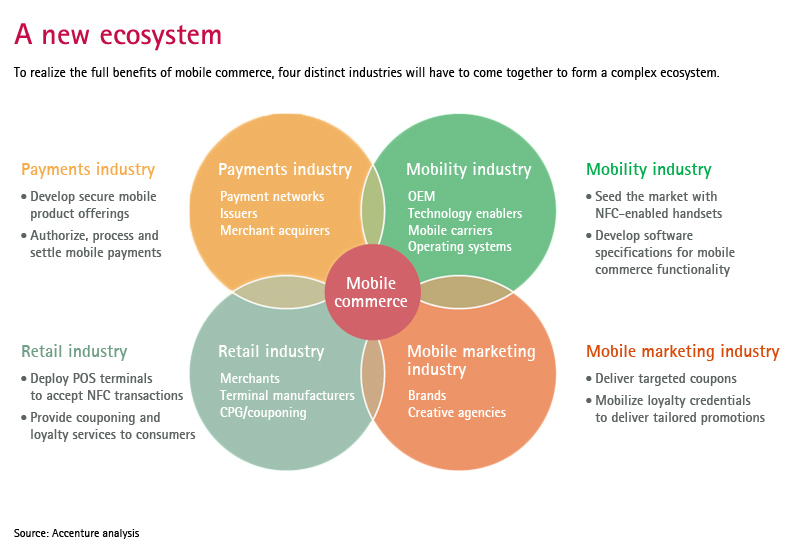 This flurry of activity in NFC mobile commerce is driving momentum and investment from both startups and incumbents across three key industries: payments provision, retail and mobile phone services. Hardware makers are placing big bets on NFC’s success. Although some reports indicate that the shipment of NFC chips may be slowing down, other research predicts that this year, 100 million mobile phones with integrated NFC capability will ship worldwide. That figure is expected to grow to more than 544 million by 2015, approaching 30 percent of all mobile phones. Many companies are making significant investments to seed the market with the necessary technology. Just one example: Payment terminal maker VeriFone has announced that all of its new point-of-sale terminals will include NFC capabilities. Early forecasts indicate that the NFC mobile payments market alone—just part of the overall mobile commerce picture—will represent about $205 billion globally by 2015. Currently, the bulk of the NFC payments activity is in Asian markets, but the Western economies are expected to catch up very quickly. Western Europe’s slice of the NFC payments pie is expected to rise from 6 percent today to 24 percent in just four years. While the vast majority of mobile commerce discussions and research focus on mobile payments, this use alone is not enough to drive consumer adoption. Clearly, the true long-term differentiation of this technology will be through mobile marketing. It is true that NFC payment transactions are completed a little faster than cash or credit card transactions. However, from a consumer’s perspective, the marginal benefit is not significant enough to encourage them to change behavior. The numbers bear this out: Contactless credit cards were widely distributed in the United States a few years ago; today, however, they account for less than 3 percent of credit card transactions in this country. In other words, consumers saw no big advantage in tapping over swiping. Accenture’s own research shows that less than half of so-called tech-forward consumers (those early adopters of the latest technology) worldwide are anticipating the day when they can use their phones to make payments. In the United States and some European nations, that figure is as low as 29 percent. Over the long term, then, growth and differentiation will come from NFC mobile activities in areas including advertising, mobile couponing and loyalty points. Research by Accenture and others confirms that consumers are excited by the idea of such mobile marketing. Third-party surveys show that nearly 60 percent of global consumers would be likely to redeem coupons delivered to their mobile device and that they would value the personalized communication. No longer will consumers have to stuff paper coupons and plastic loyalty cards into their wallets to capture their savings; instead, the information contained in those coupons and cards would be available on their phones. One specific area that is likely to see strong pickup is mobile advertising. Today, this subset makes up just 0.3 percent of all global ad spending. It’s likely that the new technology will pull funds away from conventional ad channels as NFC payments proliferate. That said, mobile payments, although not the key attraction for consumers, must still be the foundation of a company’s mobile commerce solution so that customers can both gather new information and act on it. If, for instance, a shopper can use his phone while in the store to learn about promotions and the products themselves—and perhaps even do some comparison shopping—then he is more likely to use his phone, already in hand, to pay at checkout than he would be if he had to get his phone out of a pocket just to use it instead of his credit card. Or consider a producer of energy drinks that is creating a marketing campaign for a specific customer segment—long-distance truckers, for example. When a driver receives the promotion and later purchases that particular drink at a truck stop, it creates a direct link between the promotion and the customer. So the drink maker can now analyze, in real time, the effectiveness of its marketing campaign and quickly adjust triggers such as timing or pricing, or alter its target segments for the promotions. The drink maker can also build intimacy with its customers by understanding their behaviors and buying patterns well enough to finely customize its offerings to them. This is possible today to a limited extent in the physical supply chain through loyalty programs. But mobile commerce takes deeper levels of targeting to a much wider customer set. Capturing the NFC mobile commerce opportunity is hardly a straightforward proposition. Historically, there have been three barriers to market realization: business model definition, consumer adoption and merchant acceptance. To date, the tendency of most mobile commerce participants has been to pay attention to all three of those barriers. However, given the numerous mobile commerce pilot programs now running, we believe that players have partially overcome the business model barrier and are starting to find solutions for models that involve multiple partners. Instead, we contend that winning merchant acceptance—directly related to acceptance by consumers—is now the most critical success factor. Therefore, NFC market participants should concentrate their efforts on motivating the retail channel—particularly the large chains that compete fiercely with one another and that set the benchmark for the retail sector overall. The group has shown little “first mover” activity in mobile commerce up to now. Industry participants will have to overcome several major hurdles if there is to be widespread merchant acceptance. First, they have to convince merchants that consumers will be able and willing to use mobile commerce if merchants commit to it—the chicken-and-egg question also confronted by consumers. The skyrocketing use of smartphones—more and more of them NFC-enabled—appears to answer the first part of that question. The second part—consumers’ willingness to engage—looks more positive by the day as surveys reveal strong interest, particularly in mobile marketing. Mobile commerce players also have to answer the “What’s in it for me?” question for merchants. As noted earlier, the most alluring promise of NFC mobile marketing for merchants is that it opens up direct connections to their consumers. For instance, the couponing business is huge: In 2010, US marketers distributed 332 billion packaged goods coupons—up almost 7 percent over the prior year. And couponing relies largely on a mass-market business model, which could become a truly individualized channel. For example, a consumer products company could issue a coupon for swim diapers to a young mother who—the data indicates—regularly takes her baby to the pool. If she uses her NFC-enabled phone to redeem the coupon and purchase the diapers, the company would have valuable information about the effectiveness of its promotion. At the same time, the costly and labor-intensive supply chain for couponing can be made much more efficient and timely. Additionally, merchants can gain fresh insights into both customer preferences and shopping behavior. They can also use the growing volumes of mobile commerce data to target their marketing and advertising investment more effectively—spending less to get more. There are many indications that mobile commerce will drive customers back into stores, where they will take part in blended mobile and in-store shopping experiences. Prospective players in mobile commerce need to be aware that the migration to contactless payments will require merchants to make not only a substantial investment but to do so at a time when, particularly in mature economies, flat growth and shrinking margins are the order of the day. At $150 per reader, that means a collective investment of roughly $500 million across all US merchants to top the 25 percent merchant adoption rate that will make the technology interesting to the consumer and result in lasting behavior change. VeriFone’s announcement that all of its POS terminals will be NFC-enabled is a good first step in addressing the investment burden. This initial investment would allow merchants to accept contactless mobile payments. Accepting NFC transactions would require them to commit further development effort and time. Depending on their POS environment, merchants will almost certainly need to change their POS software and back-end systems in order to support mobile couponing and loyalty activities that integrate fully with their existing couponing and loyalty programs. Necessary changes to some of the more complex POS systems could take 12 to 18 months, given the effort involved and the substantial commitments many merchants have already made to other IT releases. Retailers will also need to spend on marketing campaigns that get consumers to use NFC liberally—signage, ad campaigns and almost certainly a shift of marketing investments to mobile placements for consumer brands. All the signs indicate that mobile commerce is a sizable market opportunity that we expect will reach critical mass over the next five years. To properly capture the opportunity, industry participants must be aware of the barriers—especially the need to enlist merchants—and actively develop plans to break down those barriers. Those efforts must start now. Paul Rakowski is a senior executive in Accenture Strategy. He works with communications, media and technology clients in North America and the Asia Pacific region, helping them develop and execute growth strategies and improve operational performance. One of his current focuses is on the opportunities presented by the growth of the mobile internet. Mr. Rakowski is based in Boston. Robert Hasson is the m-commerce product and development lead for Accenture Mobility Services. He has extensive experience in mobile architecture and solutions, including machine-to-machine technologies, as well as in networking and telephony infrastructure. Previously, Mr. Hasson headed mobility development in the Accenture Technology Labs, during which time he led much of Accenture’s near-field communications work. He is based in Sophia Antipolis, France. New York City-based Reshma Patil is a manager in Accenture’s Communications, Media & Technology Strategy group. Ms. Patil has nearly 10 years of experience working in the communications industry across a breadth of strategy projects. The authors would like to thank Nichole Jones and Danielle Haber, who made valuable contributions to this article.